You have probably noticed that some of our native oaks come into leaf earlier in the spring and shed their leaves in autumn, but on some trees leaves remain until winter. All are called simply oaks. A powerful and stately tree which grows to its full height during its first hundred years and then only becomes more portly and splendid. Five thousand years ago half of our forests were probably oak forests because the warmer climate at that time suited them well. With the development of agriculture oak forests became fewer. Oaks grow well on fertile and moderately moist soils and that pointed out areas where burn-beating could be developed. Forests were felled, ground turned into fields. But we know that in Läänemaa, Saaremaa and elsewhere too oak forests survived. Oaks on poor, unproductive soils become low and gnarly and that has saved them. From such trees not even useful timber can be had. On trees where acorns ripen early they already fall. 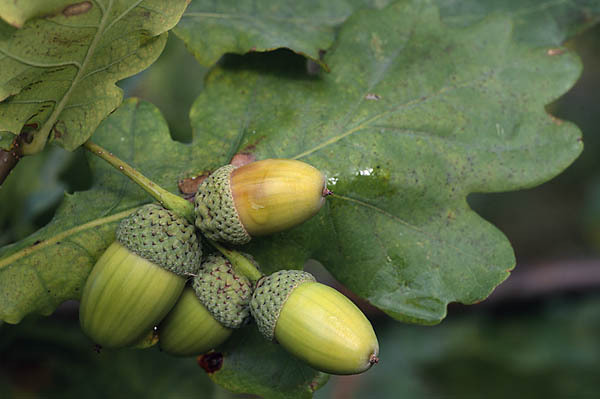 A valuable nourishment and a winter provision for very many forest inhabitants, feathered as well as furry – boars, badgers, squirrels, among birds nutcrackers, and the greatest propagators of oaks, jays.